GREAT write up! Lots of great info, thank you. One note – on your Manhattan recipe, pretty sure you meant 1 1/2 TEASPOONS (not ounces) of Angosturra bitters, right? I’ve heard from others that bitters expound (become stronger) while barrel aging cocktails so it’s wise to go easy on them, then add to taste when preparing a cocktail later. Any validity to this? Thanks for your kind comment and thank you very much for pointing out the error in the Manhattan recipe. Wow, was I off!! The 1 liter barrel will make 9 Manhattans so that is the multiplier. I’m not sure exactly what I was multiplying since it was way off. On putting bitters in barrels: The charred oak imparts some bitterness at the same time it mellows all spices and herbals. 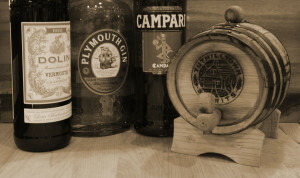 There is a marked difference in the flavors of cocktails aged with bitters in the barrel vs bitters added after aging. I try to add the bitters before aging, unless it significantly throws off the volume. I suggest you try it both ways yourself (and let me know what you think). Thanks again for the heads up on my error. Hey Gary–Very helpful. 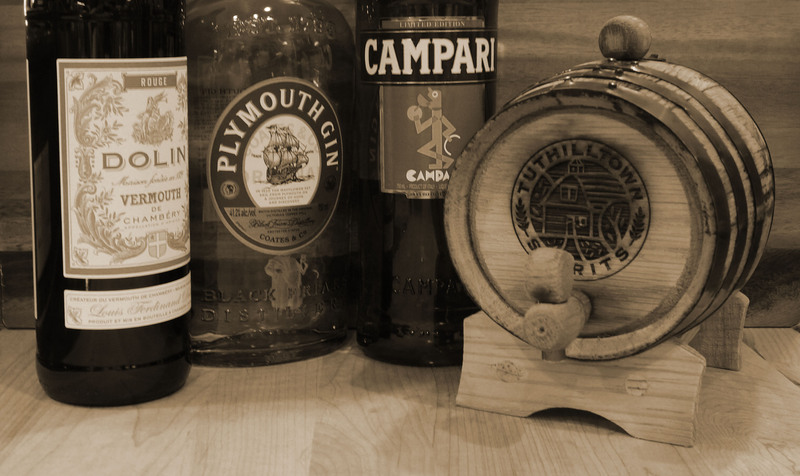 One important question…I typically keep the Antica Vermouth for my Manhattans in the fridge. Am I supposed to age the barrel in the fridge or room temperature is normal? 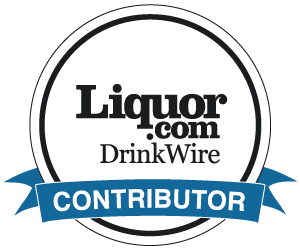 I age cocktails with or without fortified wines at room temp. Oxidation is part of the flavor profile barrel aging produces. When it’s aged as long as you want, triple filter (fine mesh, metal coffee, paper coffee filters) then refrigerate. Generally best in a few weeks but I’ve had a few remain good for months! Oh, check out our follow up article http://docelliott.net/why-you-should-be-barrel-aging-at-home/. Being new to this I have a few questions. #1, I started the 2 lt. barrel with Manhattans and will be making Negronies next. Do you need to rinse the barrel before making the Negronies or just put the ingredients in? #2, What do you recommend to fill the barrel with if not using it for a few months until I start it up again. Thanks for your help. On rinsing the barrel between cocktails: I gently rinse once or twice with cold filtered water, just to remove any liquid from the previous inhabitant. I assume that the cocktail flavors absorbed by the barrel could be significantly reduced by vigorous rinsing. On filling the barrel between uses: I tried using diluted Everclear, but that absorbed color and flavors. I would suggest that you use a fortified wine such as Sherry or Port or even bourbon or White Whiskey. Everything you put into the barrel will reduce its flavors until it is used up like a tea bag. At least a fortified wine will add some flavors as it absorbs others. 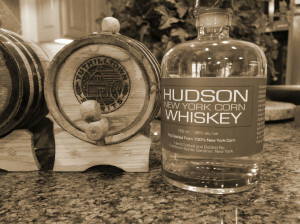 Bottom line: put something in it that is similar to or will enhance the cocktail you plan to place into the barrel afterwards. I would be interested in hearing how the ‘Angle’s Share’ effects your volume in a 2 Liter barrel. I’ve been exclusively using 1 liter barrels so I can run more cocktails through them. The Angel’s Share in a 1 liter barrel is about 30% at 4 weeks! The greater surface to volume ratio that allows me to speed up the aging process, also increases the evaporation. Please let me know how it goes for you. Thanks for getting back to me so quickly. 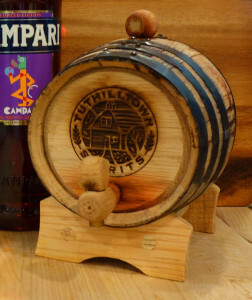 If I use my barrel for just Manhattans and negroni ‘s do you think Sherry would be best? How long can you leave the Sherry in the barrel for in between uses and can you use it over again? I’ll let you Know how much is lost in the first batch. Sherry will work great. 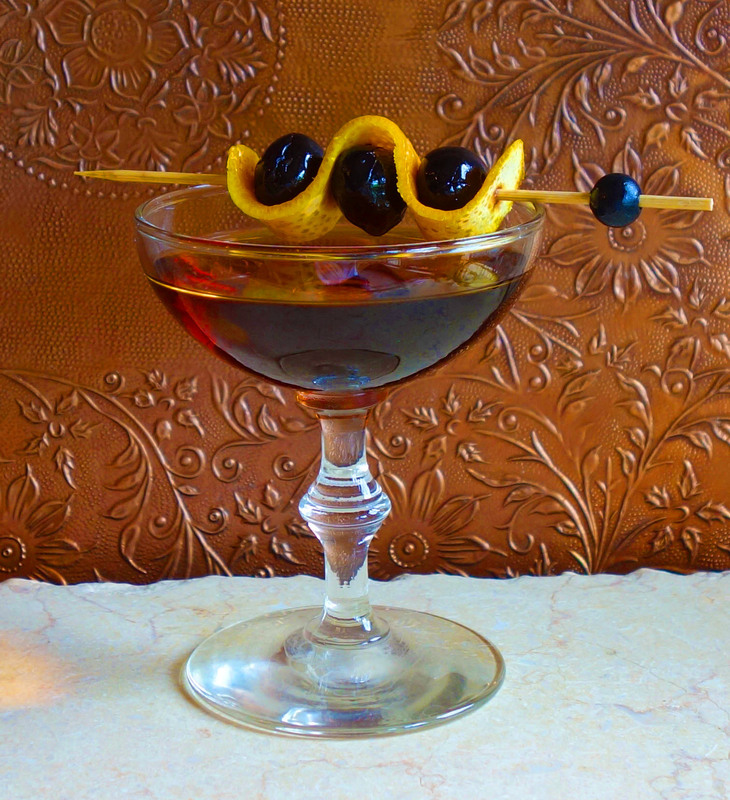 It really enhances anything with sweet vermouth. I use the Sherry over and over again. Just keep it in the refrigerator between barrel times, and replenish it with the same type and brand as needed to keep the volume up. I also use the Sherry in various un-aged cocktails. 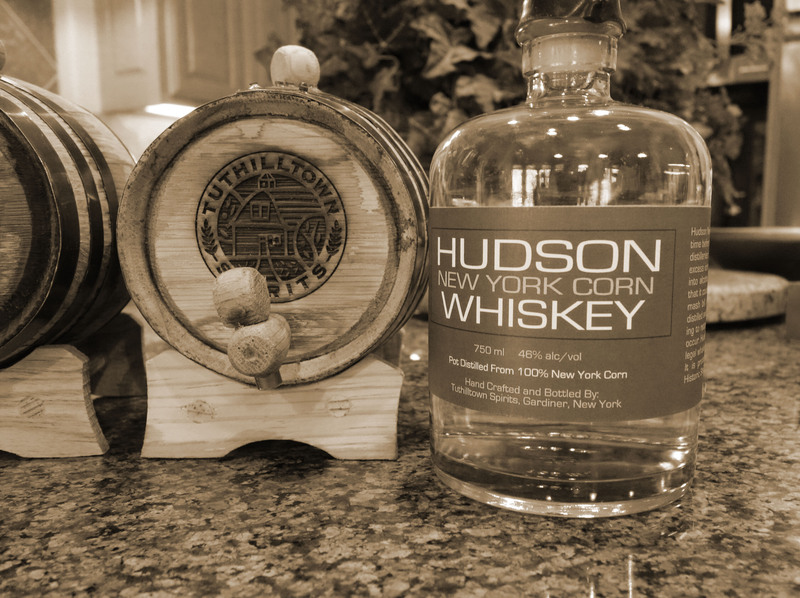 See http://docelliott.net/manhattan-2-0/ As far as how long to keep the Sherry in the Barrel: to flavor the Barrel, I would leave it for 4 – 6 weeks. As for the Sherry, I find that it reaches a point in aging where it doesn’t change much. Probably because I’m using some of it along and replenishing with new. Otherwise, leave it in there as long as you need between cocktails. Just emptied the barrel of Manhattans after four weeks and can honestly say they tasted better in week two than in week 4. Will make another batch right away and see how this batch turns out. It’s interesting how much variation there is between batches. One time perfection is 2 weeks and other times 6 with the same barrel! It is such a burden to frequently taste cocktails! 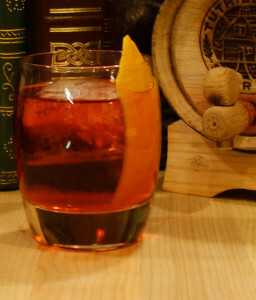 I just pulled a Negroni out of a whiskey barrel after 4 weeks. It is much more mellow than previous batches. Thank you again for all the help, I appreciate it. Great advice thanks! I have just finished my first batches of barrel aged cocktails, one manhattan and one boulevardier. I am wanting to put in some sherry between batches ands wondering what type/brand of sherry you would recommend? Some for the whiskey or bourbon? I used Lustau East India Solera Sherry. I think that it flavors the barrel and ages well. I actually haven’t tried a different style of Sherry. I’m not sure that a Pedro Ximenez, Amontillado or other style would either age well or impart flavors I’m trying to add. For the whiskey, I use Hudson’s. I would think any premium brand would do fine. Bourbon in the Sherry barrel is great, and the tequila that followed it is awesome, (Tequila Manhattan anyone?). As far as bourbon brands, I use Russel’s 10 year. 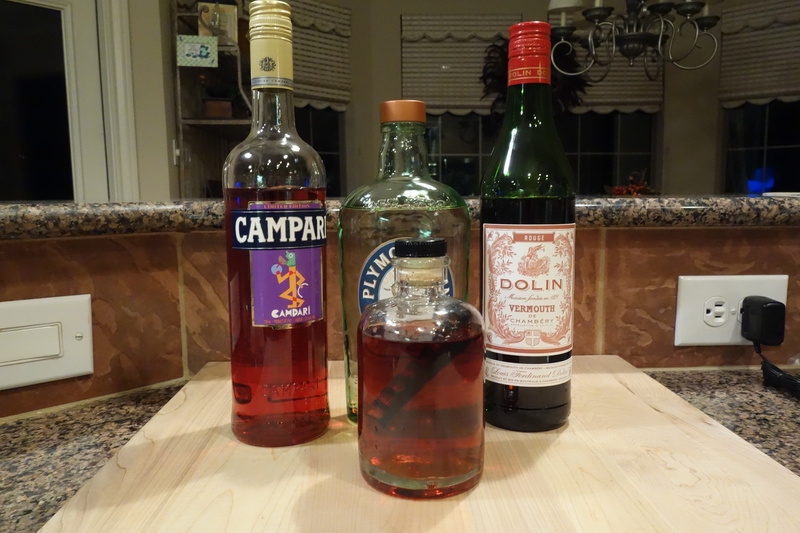 How did the Boulevardier turn out? Thanks for visiting Doc Elliott’s. 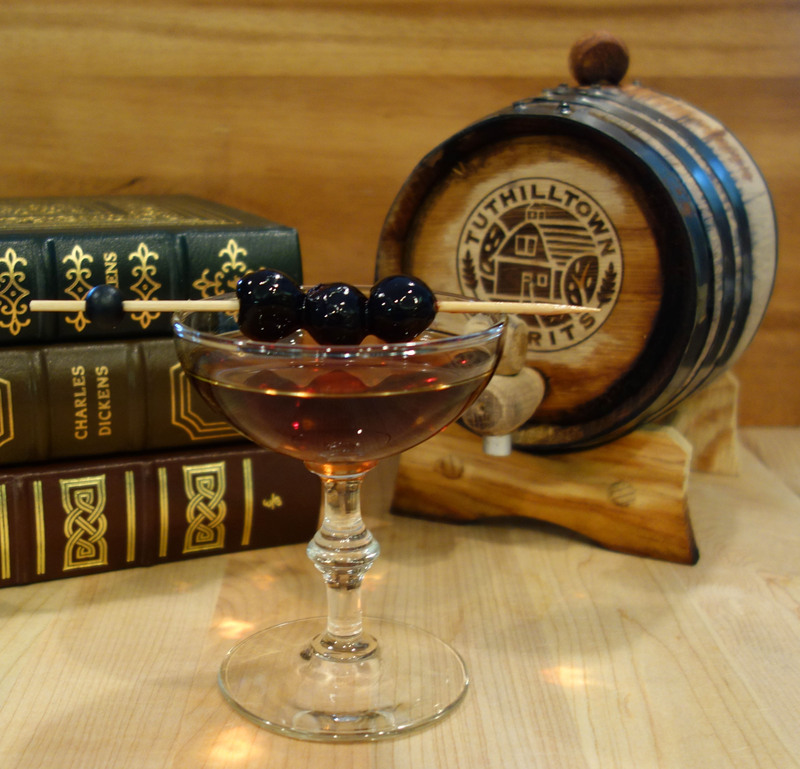 Check out our other Barrel Aged Cocktail page: Here. Ok. I can’t find the East India Solera Sherry in south Florida. Any other recommendations? What type of sherry should I look for in generL? The Solera is an Oloroso sherry. So try an Oloroso or an Amontillado. I would think that the Amontillado would be preferable since it will be more complex. I am planning to use a Maderia in the near future. Thanks for reading and let me know how it goes. 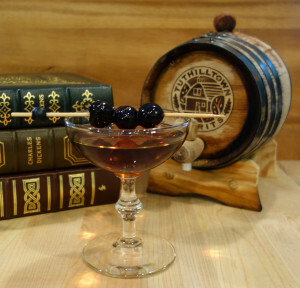 What are your thoughts/experiences on using Rye versus bourbon (for aged Manhattans)? I haven’t tried rye in a barrel. If you prefer rye to bourbon, it should work for you. Let me know how it goes. Hi, I want to subscribe for this blog to get newest updates, thus where can i do it please assist. 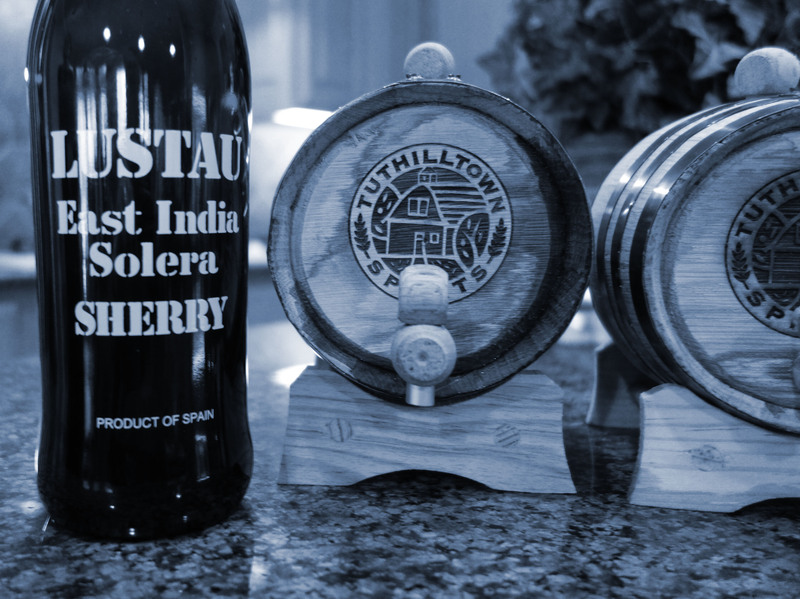 So… Here is what I’ve aged in my 2 liter barrel so far: Sherry, Manhattan, Sherry, Bourbon, Tequila, and right now Sherry again… I want to spice things up for the holidays, but I need some expert help here… I want to try to do a barrel aged pumpkin Manhattan or old fashioned… Any ideas/tips? Sounds interesting. I’d like to hear how your spirits and cocktails have turned out so far. As far as aging an Old Fashioned, you’ve basically already have done that by aging the bourbon. I will say that aging an Old Fashioned with bitters will add some interesting complexity to your barrels subsequent inhabitants. I would recommend not putting fresh pumpkin in a barrel. The alcohol level will keep it from rotting but it could easily sour and ruin the cocktail and the barrel. Pumpkin flavored bourbon or rye could make a very interesting barrel aging experiment. If you’re using quality spirits, I think it will work. 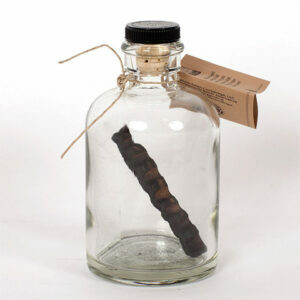 Plus, it will have an effect on the next cocktail/spirit, especially if you don’t put the sherry back in between. I did something similar with Fireball whiskey followed by un-aged brandy. The brandy came out as a great sipper. I would plan ahead what you’re going to use to follow the pumpkin Manhattan. Question: After making my first batch (Old Fashions), I am contemplating my next and considering either Negroni or a Boulevardier. My question: After emptying the barrel what steps should I take to prepare the barrel for a different drink mix? Or is that required? Just rinse the barrel a couple of times. If you seasoned the barrel with a spirit or fortified wine, you should put that back in for 2-3 weeks before adding the next cocktail. That will “recharge” the barrel by replacing some of the flavors absorbed by the cocktail. Thanks for the response! Sorry I did not reply earlier. I did as suggested and the Negroni came out great! 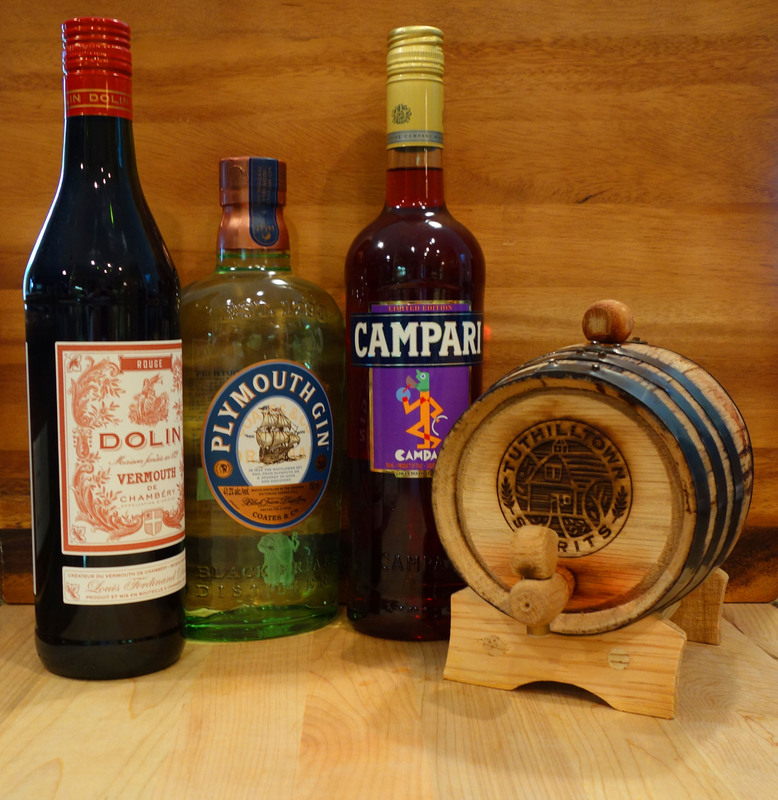 Any idea of how long to age a Negroni in a brand new 10 Liter barrel? I’m thinking it will be at least six weeks, but would love to hear your thoughts as I won’t be able to check it every day due to travel constraints. A 10 liter barrel could easily take 12 weeks or more. A 1 liter barrel will take about 3-4 weeks. I like to churn cocktails so the largest I use are 2 liter. All I can suggest is lots of tasting. (Tough job!) Also, watch the angle share. If you keep it topped off you’ll loose a lot less. Angle share accelerates the more is lost. Let me know how it goes. After about two and a half weeks of aging an old fashion, I bottled the batch and promptly noticed it was pretty cloudy and even had some sediment and floating debris. It was my first attempt and I previously had rinsed the barrel with water and primed the new barrel for about three days with water only . The only other thing I did for prep was to seal the ends with bees wax. The cloudiness and debris doesn’t seem right. Where might i have gone wrong? Thanks! Couple of questions: Did you filter your old fashioned after aging? And, when you open the bottle does it release gas? Lastly, are you refrigerating the bottle? BTW, keep the barrel full of some spirit while we sort this out. I did not filter after aging. I had re-corked the original bottles and simply refilled them directly from the spigot. I don’t recall any gas or pressure when I pulled the bung (I did this so the liquid would flow smoothly), but I get some gas escaping when I open the bottles I have refilled. It’s very slight, but you can hear a bit of gas escaping. I’ve kept them refrigerated ever since refling. Thanks for quick response. Sorry it’s been so long. I just saw this. I initially found that cocktails and spirits would become cloudy and bitter after 10 days or so. After further work, I found that triple filtering through fine mesh, metal coffee filter and finally paper coffee filter will allow you to keep your cocktail clear and unchanged for months (refrigerated). Hope this helps. Happy New Year! •	Rinse your barrel with water then fill with filtered water and let sit for 24 hrs. •	When your cocktail is ready, strain through a fine mesh strainer. Age for approximately 4 weeks, tasting frequently.